Barebones PCs – partially assembled rigs that need memory and storage adding – occupy a strange niche between buying fully assembled pre-built systems or simply doing everything yourself. They do make more sense when it comes to mini-PCs, though, as such systems often have complicated or at least non-standard layouts in order to make their shape and size possible. Such is the case with the Zotac Zbox Magnus ER51060, which crams a desktop AMD Ryzen 5 1400 quad-core CPU and a GTX 1060 3GB into a fairly small cuboid chassis with a custom motherboard and asks you to fill in the blanks. Zotac does offer 'Plus' and 'Windows' SKUs that comes with single-channel 8GB DDR4, a 120GB M.2 SSD, and a 1TB 2.5” HDD pre-installed (as well as a Windows installation in the case of the latter), but they are less easy to find. You can pick better hardware and get better value with the barebones SKU. The cuboid chassis has metal sides, but plastic is also used – the front panel and roof, for example. The roof is essentially one large honeycomb mesh, and it has a finer-grain mesh below this that acts as something of a dust filter, since this is the primary intake zone. Overall, build quality is middle of the road; the Zbox holds together fine, but it won’t amaze you in this department. 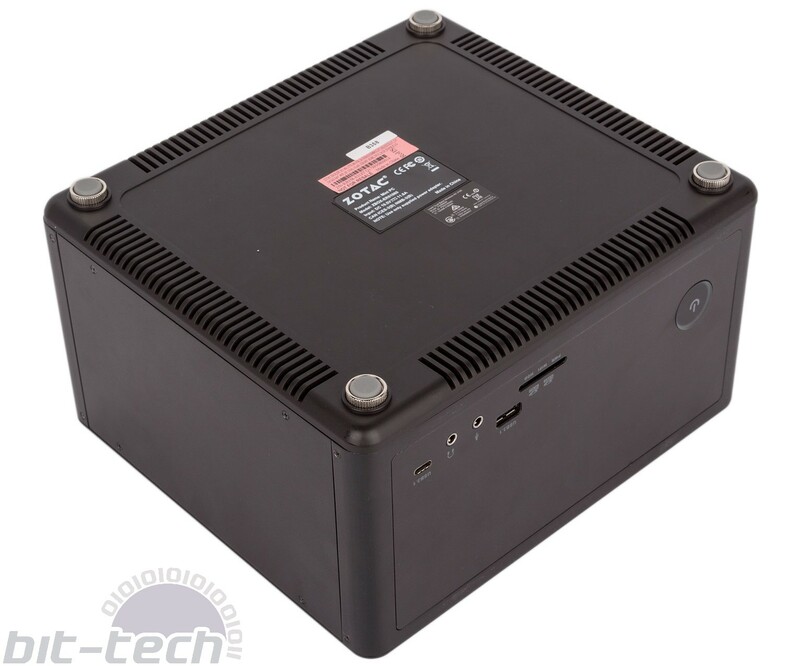 The power supply is external to the main unit, which of course helps in reducing the chassis’ footprint. It’s a laptop-style mains adaptor capable of delivering up to 230W to the single DC-in connection, and the brick isn’t too big or heavy. Also in the box is a USB stick with drivers, although we found that Windows 10 took care of everything automatically, as well as two antennas to support the wireless capabilities (802.11ac and Bluetooth 4.2). The Zbox Magnus ER51060 has a large power button with an orange power ring LED around it (possibly not to everyone’s taste), but there is no reset button. Otherwise, though, the front panel is modern and well connected, offering USB 3.1 Gen 2 connectivity in the form of both Type-A and Type-C ports. You also get the usual pair of 3.5mm audio jacks for headsets. Moving around to the back, we find four more USB 3.0 ports and dual Gigabit LAN ports from the motherboard as well as the standard Nvidia display outputs on the graphics card: three DisplayPort 1.4 headers, one HDMI 2.0, and one dual-link DVI-D. All audio solutions will need to hijack the audio feed built into the DisplayPort and HDMI outputs, as the Zbox offers none of its own. Overall, we have no complaints about the Zbox’s connectivity. The four rubber-tipped feet act also as the chassis thumbscrews. With these and the bottom panel removed, you have very easy access to the swappable components, so fleshing out the barebones PC could hardly be easier. The SODIMM memory and M.2 modules slot into place (the latter needs a screw to secure it), while 2.5” drives have a plastic bracket. You also get a CMOS clear switch in case things go wrong, and there’s a tiny fan here described by the PCB as an SSD fan. Since the motherboard itself closes this area off from the main cavity above, this fan is responsible for the only airflow this area is likely to see. Users can install up to 32GB of DDR4 using the dual-channel SODIMM slots, with 2,133MHz and 2,400MHz kits supported. 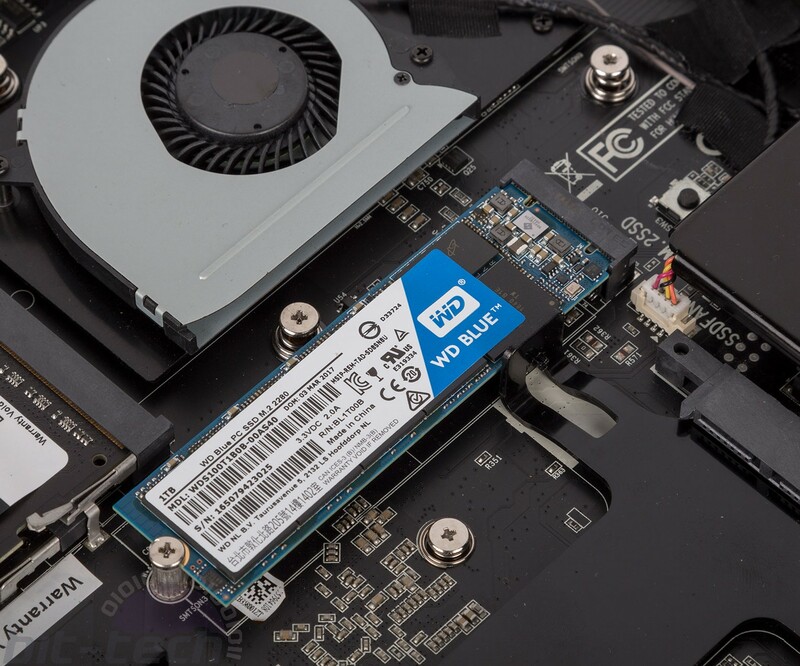 The M.2 drive can use either the SATA interface or the faster PCIe 3.0 x4 one, which gives you nice flexibility, and the 2.5” SATA drive can be up to 9.5mm thick, covering all modern SATA SSDs and HDDs. For our system, we used a 16GB (2 x 8GB) Corsair Value Select 2,133MHz DDR4 memory kit and a 1TB SATA WD Blue M.2 SSD. Removing the back panel shows us a clearer view inside. The custom motherboard sits flat near the bottom of the case, with a standard AM4 socket used to mount the Ryzen 5 1400 CPU, which is cooled by GPU-style blower cooler. Meanwhile, a riser card is used to allow the GTX 1060 card to be stacked horizontally above the motherboard and CPU cooler. This design means there’s quite a lot of wasted space above the CPU cooler and below the GPU. Both the CPU cooler and the GPU cooler have intake fans that face the mesh roof panel and exhaust directly out of the rear panel, which is probably optimum for a case like this – you definitely don’t want heat remaining and building up inside the case. An exhaust fan is also fitted to the left side of the case, creating a negative pressure setup that should further increase the airflow through the roof. While the use of a standard desktop chip raises the question of whether you could use other AMD CPUs in this system, there’s no mention made of it, so we’re assuming not. Plus, it would definitely void your warranty, and you’d be paying for two CPUs for the privilege of using only one. As to the GPU, this SKU uses a Zotac’s own ITX version of the GTX 1060 3GB, but you can also get the Zbox Magnus ER51070 that unsurprisingly offers the same version of a GTX 1070, giving you significantly more graphics grunt for £215 more. Unfortunately, there is no option with a GTX 1060 6GB, which is a more future-proof card than the GTX 1060 3GB, a card we don’t really ever recommend. The custom motherboard has some basic BIOS options. Overclocking is not supported, but you do get quite good fan control settings. Our testing was carried out with everything in the default configuration. The Zbox Magnus ER51060 ships with a two-year warranty. Intel- or AMD-powered, your choice.